To change those values (if desired), go to Products → Manage Products, and navigate through the tree to the parent product of the variant you're setting up. 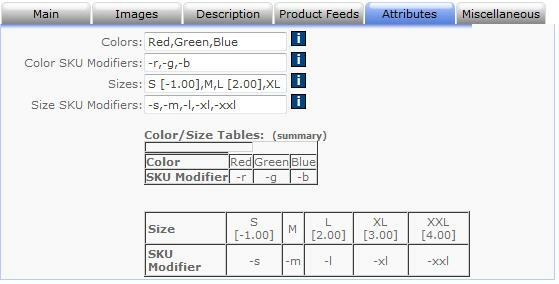 On the 'Main' tab, scroll to the bottom and set the "Color Option Prompt" and "Size Option Prompt" attributes. The values entered here will be what is used for the dropdown labels on the product detail page on your site, so set these to exactly what you want your customers to see. (e.g. Select Color OR Select Size). To enable this, go to Products → Manage Products, and navigate through the tree to the parent product of the variant you're working on. On the 'Main' tab, scroll to the bottom and set the "Track Inventory by Size and Color" option to 'yes' and click 'Update'.